The EPA has given Carlingford Tidy Towns a special award for innovation for their 2017 project promoting reusable cups. Reusable plastic cups, called green goblets, for sporting events and community groups were used to replace disposable plastic or paper cup/disposable single use plastic bottles. 3240 cups were ordered from Green Goblet Limited. The cups have the Carlingford Tidy Towns logo and Louth county council logo. They also have #refillnotlandfill on them. They are sturdy and at the end of life can be recycled. They are dishwasher proof and suitable for hot and cold beverages. Carlingford Tidy Towns contacted local runs asking them to participate. The first run, The Carlingford Half Marathon (4th March 2017) were easily persuaded as the events organisers wanted to have zero to landfill by 2020. They were called 26 extreme. The run raised money for St Brigid’s School, Dundalk. Carlingford Tidy Towns asked for feedback on the Carlingford Half Marathon and 10km Facebook page. It was mostly very positive. comments were left by runners as feedback. Any runs contacted all agreed to participate. Carlingford Tidy Towns then contacted the Cooley Coast Run (see their Facebook page) for 12th May 2017. This was a big move for them as they had to change from plastic bottled water (which was usually sponsored) to tap water, vats and the cups. But they did it! And Carlingford Tidy Towns are keen to reduce waste on the course making it more sustainable. Here Carlingford Tidy Towns saved 1000 plastic water bottles from ending up in recycling waste or landfill. They say on their Facebook page “Thanks to Carlingford tidy towns for supplying the reusable cups and for helping with their wash up. They are available for any event that is trying to cut down on waste, a necessity in these times of disposable everything”. Carlingford Tidy Towns are also helping The Carlingford Wild Run on 19th August 2017 to promote their ‘no trace race’ Carlingford Tidy Towns came up with this idea together with race organisers in 2016, this is the second time the race has run and is again no trace. This year The Carlingford Wild Run will also be using the cups, supported by volunteers. 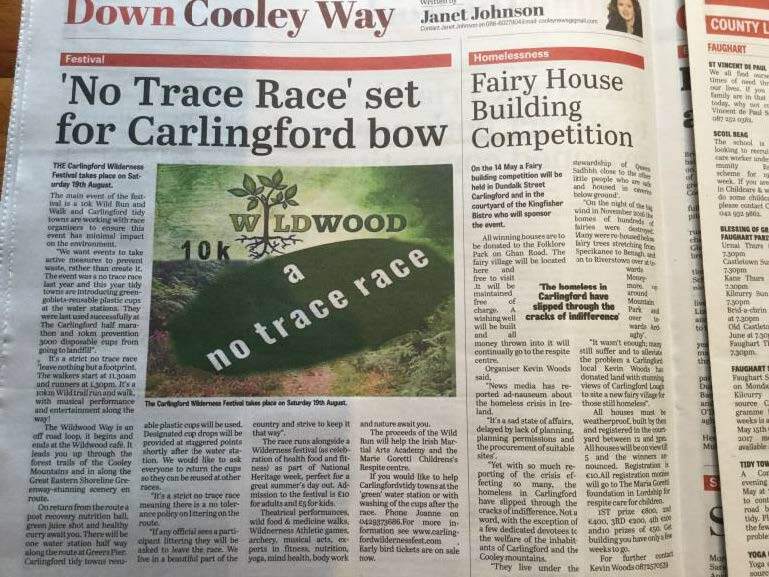 The race raises funds for the Irish Martial Arts Academy and the Marie Goretti Children’s Respite centre (see Newspaper article – No Trace Race for Carlingford bow’. On August 4th 2017, Carlingford Land of Legends Olympic Triathlon have also used the cups. This race is organised by the Setanta Triathlon Club. Carlingford tidy towns- using around 30 cups for the Spring Clean and Love your Lough beach clean. These cups have served to increase awareness about waste prevention in this time of disposable living. There is a desire for events to reduce waste and this project provides them with a way of doing this. 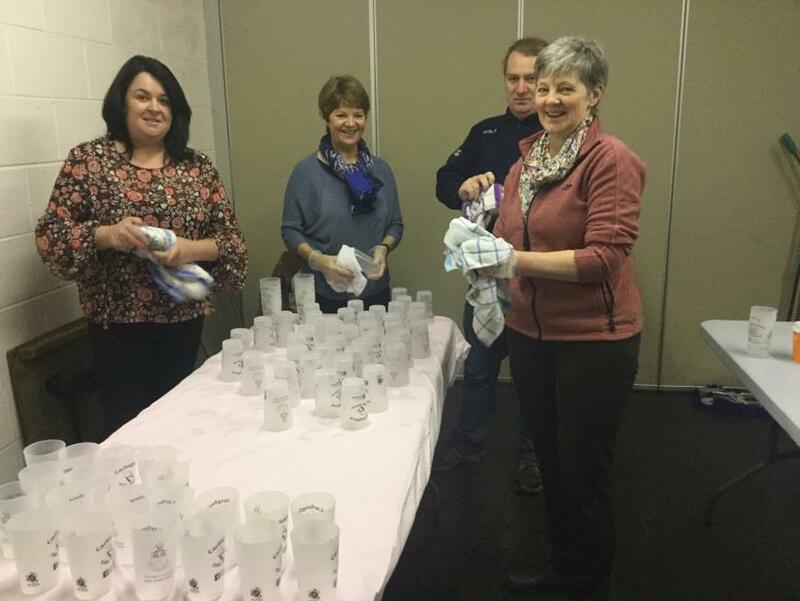 The cups are held by Carlingford Tidy Towns and are loaned out at no cost. The charity events only run one event yearly so its perfect that they can borrow this resource. Carlingford Tidy Towns also assist with manning the water stations and the washing of cups. The cups are collected in large clean grass bags marked Cups, Refill not landfill, Carlingford Tidy Towns. It is best to place one (held by a volunteer) at the water station, the second 50m from the water station and then a third another 50m along. There is no waste generated, the water stations are ‘clean’ and there are no cups to trip over. Its suitable for races with 0-1300 runners. Anymore and the wash up would take too long. Six volunteers can wash 1000 cups in 1 hr. They can be stacked in a pyramid to airdry on a dry sheet or dried with tea towels. It has also formed relations between themselves and event organisers and community groups. There is a low loss rate if cups are well looked after. They only lost 20 out of 1000 in the first race. (2 %) The volunteers encouraged everyone to dispose of their cups in the bins and when asked if they could take them home, they said no, as they are to be reused in other events. They hope that other runs will follow in their footsteps. 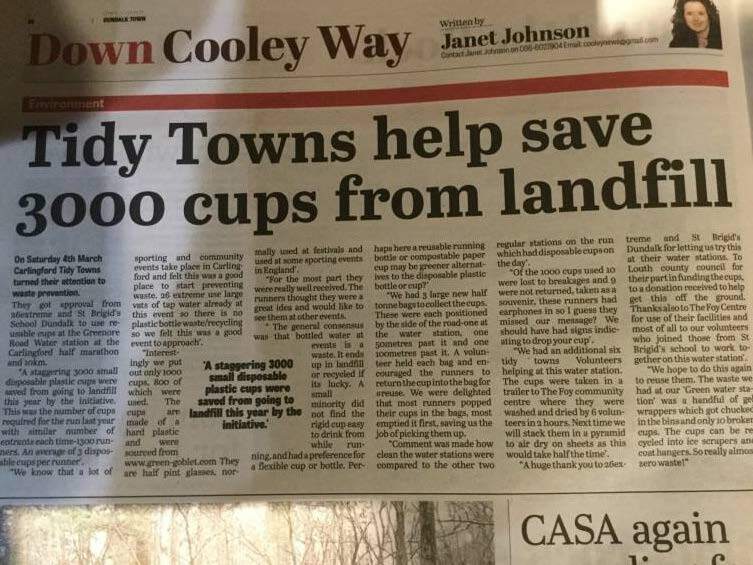 Carlingford Tidy Towns have since been approached by Cobh and runners in Northern Ireland, asking where they got the cups as they wanted to order some and replicate the idea. 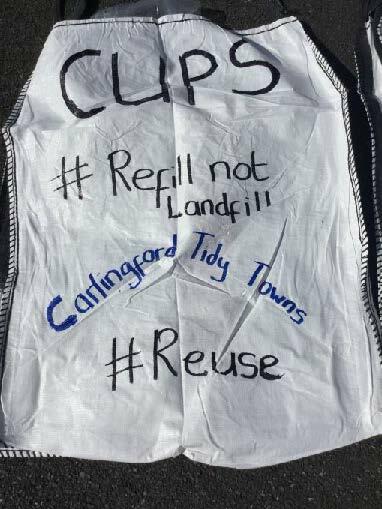 In Carlingford, there are a variety of events most weekends, and Carlingford Tidy Towns hope event organisers will use the cups and take other steps to make their events greener with less waste and litter. Carlingford Tidy Towns hope that all small running /sporting events can move to resusable cups like they have, in Ireland and further afield. It their step towards a Zero Waste Ireland.